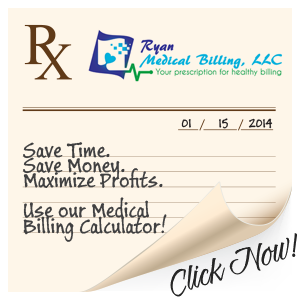 Ryan Medical Billing Contact Us - Ryan Medical Billing in Ocala, Florida. An ICD-10 Proficient Medical Billing Company that saves you money! Contact us today about taking care of your medical billing! Contact us today for all your medical billing needs! Should you outsource your billing and collection processes or handle it internally? It can be a tough decision to make, because it is difficult to calculate the true cost and benefits of each approach. Use this simple medical billing calculator to understand the most important criteria and help you make this decision for your practice. We are an ICD-10 Proficient Medical Billing Company that saves you money! We welcome you to contact us if you have any questions or requests concerning our services. We will respond to your message within 24 hours.